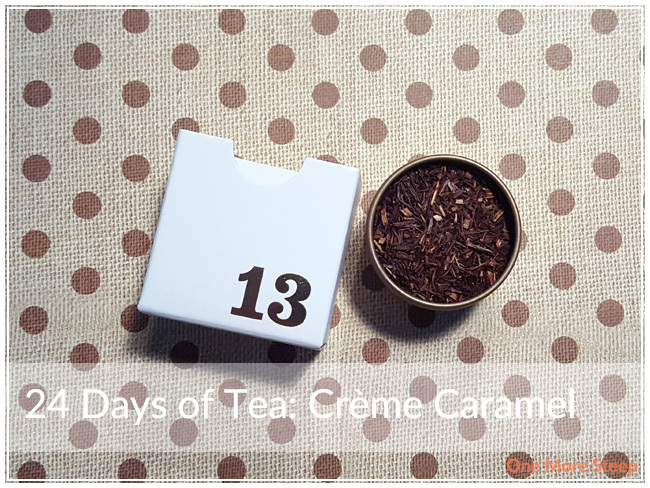 Officially into the second half of the 24 Days of Tea advent calendar, and day 13 is Crème Caramel Rooibos. My initial reaction in seeing that it was a rooibos tea was “poop”. I don’t like a lot of rooibos teas, I’m quite particular (although I love Birthday Cake by DavidsTea). 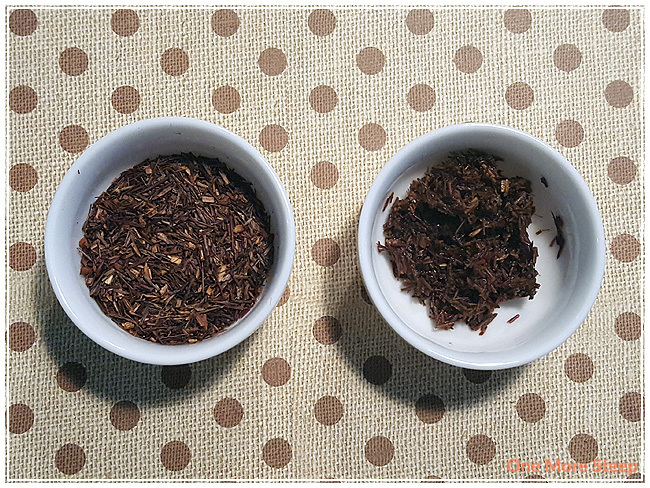 Rooibos to me often has an almost medicinal quality to the smell and flavour, and that is generally something that I don’t want to have in my cup because it’s not pleasant to me. 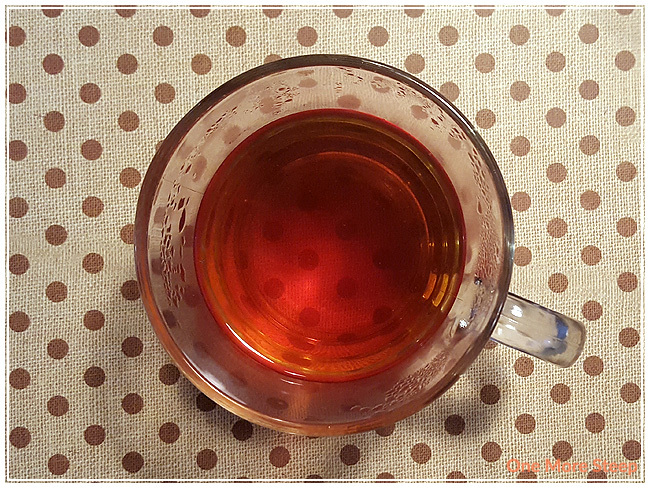 Crème Caramel Rooibos has a slight caramel smell to it, but more heavy on the rooibos side. Crème Caramel Rooibos consists of: rooibos, caramel pieces, natural and artificial flavouring. For those who are lactose intolerant, it does contain milk. As you can tell from my photo above, my tin didn’t have a lot of caramel pieces in it (this may have played a role in my overall experience). The recommendation for preparing Crème Caramel Rooibos is to use near-boiling water (90-95°C/194-203°F) and to steep for 4 to 7 minutes. When I use my Breville IQ Kettle, I opt to use the French Press option (200°F) to get the water to the right temperature. I steeped my cup of Crème Caramel Rooibos for 5 minutes. Crème Caramel Rooibos steeps to have a very strong rooibos smell, very medicinal and not enough caramel in the steam that wafts up from the cup as it steeps. It does have a beautiful red colour that it steeps to, which I always like. There is a slight sweetness to this rooibos blend that I like, but it does get overpowered by the rooibos base. The medicinal quality in the smell is followed by a medicinal quality in the flavour. It lacks a creaminess that I was anticipating with a name like Crème Caramel Rooibos, and found that it benefits from a splash of evaporated milk. The cream content of the evaporated milk helps boost the caramel flavours, but doesn’t cut through the medicinal rooibos flavour as much as I would like. I did not resteep Crème Caramel Rooibos. 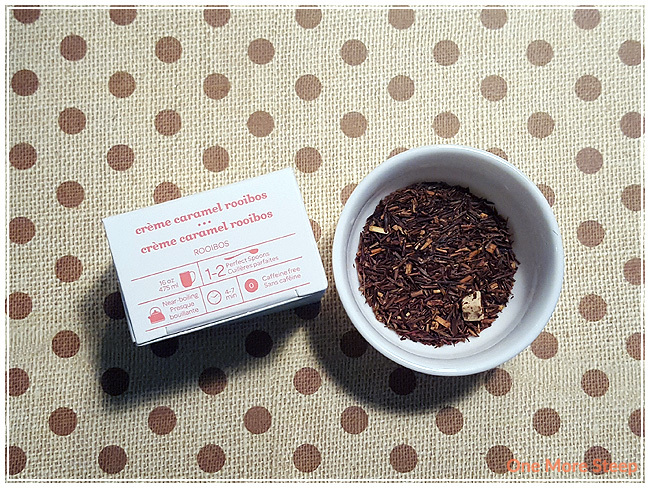 I didn’t like DavidsTea’s Crème Caramel Rooibos. I really wanted to like this one, especially with a name like Crème Caramel Rooibos because I am all about the sweets (especially in the holiday season!). I found the amount of caramel in the steeped tea to be lacking, although it did improve a bit with the addition of evaporated milk. I’m just not overly fond of rooibos as a tea base, as I’m not a fan of medicinal flavours in my tea mugs.